Legacy 2030 | Winston-Salem/Forsyth County Planning Board: What's Chattanooga doing? Chattanooga, Tennessee is another southeastern community which has recently experienced a period of downtown growth. Their plan, The Downtown Plan, Chattanooga 2025, is influenced by nine principles which all great downtowns are based on. These principles are worth considering in Winston-Salem. According to the Plan, a great downtown: supports a vibrant economy; evokes a sense of place; has a rich public realm; has sustainable buildings; is accessible via diverse modes of transportation; has a harmonious mix of uses; has people; demonstrates a respect for the natural ecology of things; and comes about through cooperation and collaboration. Most of these topics have been addressed in our past downtown plans. 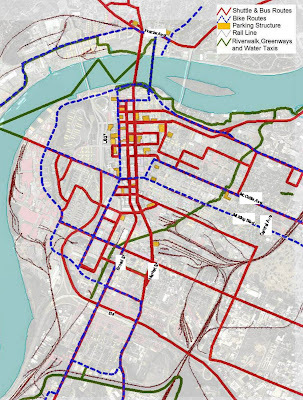 However, the in-depth discussion about natural systems in the Chattanooga’s Plan is unique and worth studying. The Plan notes that urban ecology is not an either/or proposition but rather a both/and proposition. Great downtowns respect the interdependence and integration of natural and man-made systems. The plan also identifies four sub-systems of urban ecology which must be managed: transportation; buildings; public spaces; and the natural environment. If undue emphasis is placed on any one of these to the detriment of another, a city can become unbalanced.